This device measures relative humidity, air temperature ( with probe) , and surface temperature ( with the InfraRed function) . The large, easy-to-read backlit LCD includes primary and secondary displays plus numerous status indicators. The InfraRed feature includes a laser pointer for convenient targeting. Careful use of this meter will provide years of reliable service. Display: Dual LCD with Backlight and status indicators. Temperature: Thermistor ( probe) and InfraRed. Probe Temperature and Relative Humidity: 3 minutes. 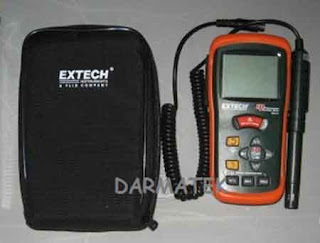 Accuracy note: Accuracy is specified for the following ambient temperature range: 64 to 82° F (18 to 28° C) . Sampling Rate: 2.5 samples per second. InfraRed Emissivity: 0.95 (fixed) . IR Field of View: D/S = Approx. 8: 1 ratio(D = distance,S = spot) . Laser power: Less than 1mW. IR Spectral Response: 6 to 14 ¼ m ( wavelength) . Operating Conditions: 32 to 122° F ( 0 to 50° C) ; < 80% RH non-condensing. Storage Conditions: 14 to 140° F ( -10 to 60° C) ; < 80% RH non-condensing. Power Supply: 9V Battery with autopower off(after 10 minutes) . Dimensions/Weight: 5.9 x 2.8 x 1.4” (150 x 72 x 35mm) ; 8.3 oz. ( 235g).